POPSUGAR visitors love to plan ahead when it comes to grocery shopping. As part of the 2015 POPSUGAR Insights Food study, we surveyed female visitors to POPSUGAR to better understand their grocery-shopping behaviors. 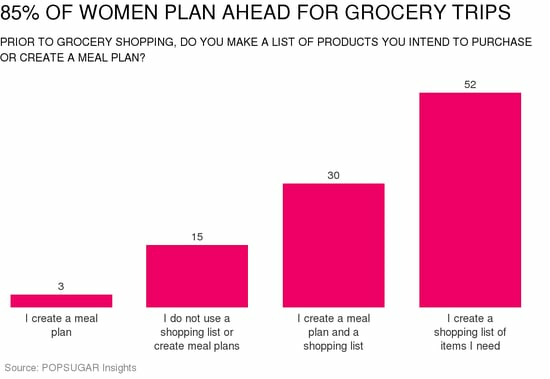 We found that 85% of women plan their grocery shopping in advance by either creating a shopping list or a meal plan. Shopping lists are more popular than meal plans, however, which points to an opportunity for marketers to help consumers plan their meals in advance. Overall, 52% of women said that they create a shopping list of the items they need in advance of grocery shopping. Thirty percent of women create both a meal plan and a shopping list, and only 3% of women create just a meal plan. Fifteen percent of women do not use a shopping list or a meal plan.